At a time when the separation of church and state is under attack as never before, Freethinkers offers a powerful defense of the secularist heritage that gave Americans the first government in the world founded not on the authority of religion but on the bedrock of human reason. In impassioned, elegant prose, celebrated author Susan Jacoby paints a striking portrait of more than two hundred years of secularist activism, beginning with the fierce debate over the omission of God from the Constitution. 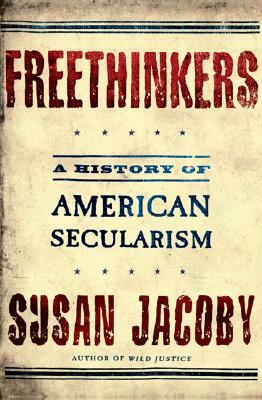 Moving from nineteenth-century abolitionism and suffragism through the twentieth century’s civil liberties, civil rights, and feminist movements, Freethinkers illuminates the neglected accomplishments of secularists who, allied with liberal and tolerant religious believers, have stood at the forefront of the battle for reforms opposed by reactionary forces in the past and today. Rich with such iconic figures as Thomas Jefferson, Abraham Lincoln, Elizabeth Cady Stanton, and Clarence Darrow—as well as once-famous secularists such as Robert Green Ingersoll, “the Great Agnostic”—Freethinkers restores to history generations of dedicated humanists. It is they, Jacoby shows, who have led the struggle to uphold the combination of secular government and religious liberty that is the glory of the American system. Susan Jacoby is the author of five books, including "Wild Justice," a Pulitzer Prize finalist. A contributor to "The Washington Post," T"he New York Times," "Newsday," and "Vogue," she lives in New York City.